The ISO 22000 standard is focused on the development, implementation and improvement of a Food Safety Management System. Food safety is a joint responsibility of all parties participating in the food chain. The ISO 22000 standard is focused on the development, implementation and improvement of a Food Safety Management System. Those who are involved in food processing, manufacturing, and distribution should adopt and implement the ISO 22000. 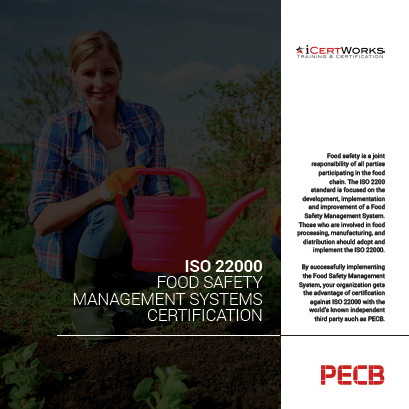 By successfully implementing the Food Safety Management System, your organization gets the advantage of certification against ISO 22000 with the world's known independent third party such as PECB. ISO 22000 certification (also known as "registration"), is a third-party audit performed by a certification body such as PECB who, upon verification that an organization is in compliance with the requirements of ISO 22000, will issue an ISO 22000 certificate. This certification is then maintained through regularly scheduled annual surveillance audits by the registrar, with re-certification performed on a triennial basis. For more information on ISO 22000 Certification, please fill out the form on the right side of the page. Contact us about ISO 22000 Certification! Looking for ISO 37001 Training?